It’s officially back-to-school time. And although school is a place where children learn and grow academically and socially, it is also a breeding ground for germs where kids can get sick. For example, check out these common “back-to-school illnesses,” such as pink eye and lice, you should know about. And with flu season rapidly approaching again, the fear of the flu and common cold is constant. To combat some of these illnesses, we often depend on an arsenal of antibiotics. In fact, the Journal of the Pediatric Infectious Diseases Society (JPIDS) reports with backing from the Centers for Disease Control and Prevention (CDC) that antibiotics are the most commonly prescribed medications for children. But what most people do not know is that antibiotic side effects in children lead to nearly 70,000 emergency room visits each year. “Antibiotic use drives the development of antibiotic resistance, which is considered a major public health threat worldwide,” according to JPIDS. (ADEs were classified as allergic reactions in the research report from JPIDS). In one tragic case, a 5-year-old girl in Greece reportedly died after having an allergic reaction to antibiotics. The girl was prescribed antibiotics for a fever by a private doctor. Reports do not identify the specific antibiotic this little girl was taking, but examples of common antibiotics prescribed to children include amoxicillin and penicillin (sometimes used to treat strep throat and other bacterial infections) and azithromycin (also used to treat bacterial infections, like pink eye). Clearly, the death of the little girl in Greece is an extreme and rare case. But we cannot ignore the evidence showing that antibiotic side effects may send our kids to the E.R. Along with fever and hives, additional allergic reactions to antibiotics in children may include anaphylaxis (which causes trouble in breathing) and diarrhea (which can cause dehydration and nutrient loss). We Are Overusing & Misusing Antibiotics. According to JPIDS, at least one third of pediatric antibiotic prescriptions are unnecessary. Remember, antibiotics are only effective if the infection is bacterial. For example, influenza (flu) is a virus. So if your child has the flu, an antibiotic that fights bacteria will not be effective. Antiviral drugs may be effective for the flu - not antibiotics. There is both bacterial pneumonia and viral pneumonia. Reportedly, viral infections are the most common cause of pneumonia in children. So it would be pointless and possibly harmful for your child to be prescribed antibiotics if they had viral pneumonia. To be clear, this does not mean that your child does not need medical attention if they have a virus. If they are very sick, seeking medical attention is always advised. But proper diagnosis and appropriate treatment is imperative. Why Are Kids Being Given Antibiotics They Don’t Need. There are a few reasons why kids are given antibiotics even when they don’t need it. 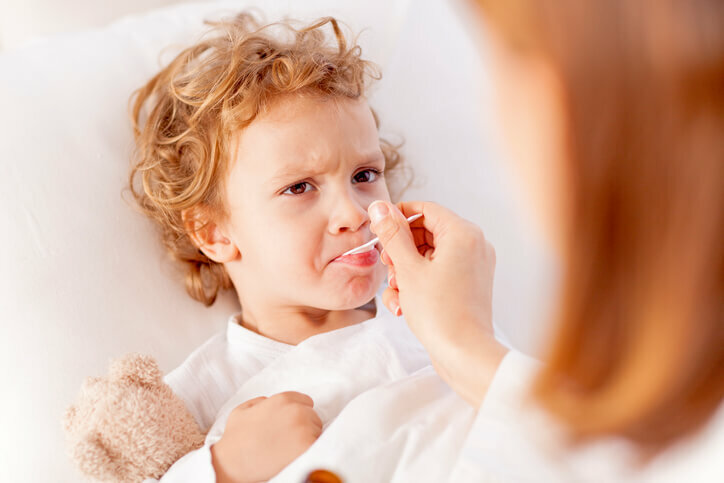 These include calming the nerves of anxious parents of sick children, doctors “erring on the side of caution” when it comes to treating infection and, quite frankly, the need for overwhelmed doctors to quickly resolve the issue and move on to other patients. “They [doctors and other healthcare professionals] may not be certain if an infection is caused by a virus or a bacteria, for example, and prescribe an antibiotic ‘just in case.’ Or they may want to get through an appointment quickly and satisfy worried moms and dads,” according to the Consumer Reports article. This detailed story from the perspective of a medical professional working in the emergency room sums up the antibiotic issue perfectly. The mother just assumed her child needed antibiotics before she was even examined by a doctor. Despite a very angry and frustrated mother, the baby was not prescribed antibiotics. The medical opinion was that they were not needed. And if antibiotics are not needed, they should not be prescribed. The next time your child is sick, clearly express your concerns to the pediatrician about whether your child is suffering from something bacterial or viral. Ask if antibiotics are absolutely necessary. Voice your concerns about drug-resistant bacteria and allergic reactions to antibiotics. Sometimes ailments, such as ear infections, clear up on their own. According to Michigan Medicine, if your child is otherwise healthy, you can can wait 48 hours to see if the infection clears up on its own. Again, if your child appears to be very sick, seeking immediate medical attention is always advised. Boost Your Kids Immune System with Proper Nutrition. In most cases, good nutrition will strengthen the immune system of children so they are less susceptible to infections. This means that it is up to us as parents to ensure that our children are eating those foods from which they can get the right amount of nutrients they need to stay healthy and support a strong immune system. You can check out examples of specific nutrients which may help here. It is also extremely important to avoid nutritional deficiencies. One of the ways you can do this, in addition to eating a variety of healthy foods, is to have your child take a comprehensive nutrient test. Such a test will determine whether your child may have any nutrient deficiencies or imbalances. Nutrient deficiencies and imbalances can negatively affect the immune system. So it may be necessary after such a test to tweak your child’s diet or have them take good quality supplements. A Few Other Preventative Steps You Can Tell Your Kids to Take?